The cold spell in New York -- temperatures have dropped to 75 degrees! 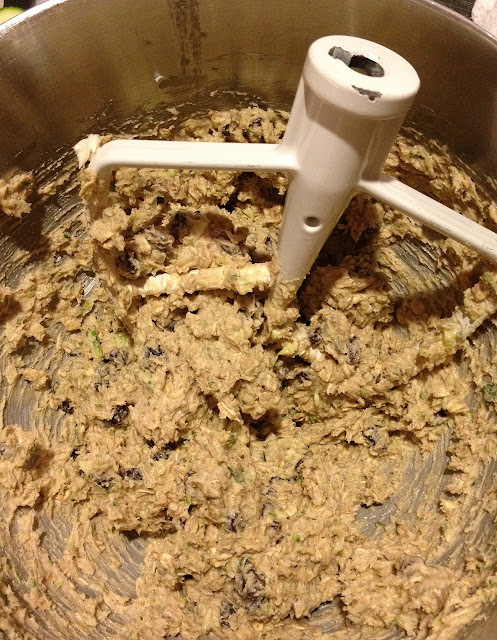 -- means just one thing in the CakeBakes household: Time to crank up the oven and bake an intriguing seasonal treat. 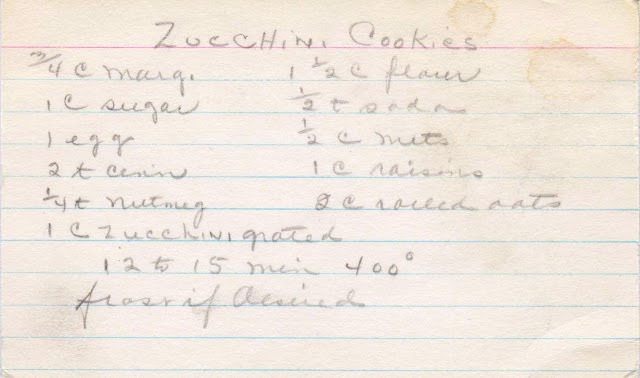 The "recipe" for zucchini cookies -- just a list of ingredients -- was written in pencil on a recipe card in my collection. 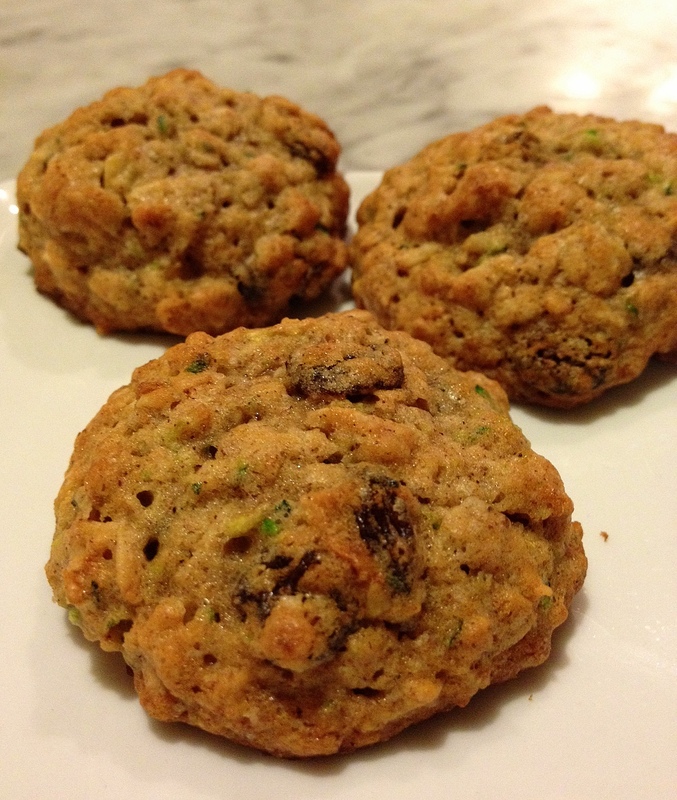 Zucchini cookies are, as my colleague Ellen said, what happens when an oatmeal raisin cookie and zucchini bread have a baby. And that is the perfect description of these unusual treats. In June, zucchini is still eagerly snapped up at farmer's markets, destined for the saute pan or grill or, in my case, oven. By August, it's become a bore and worse. 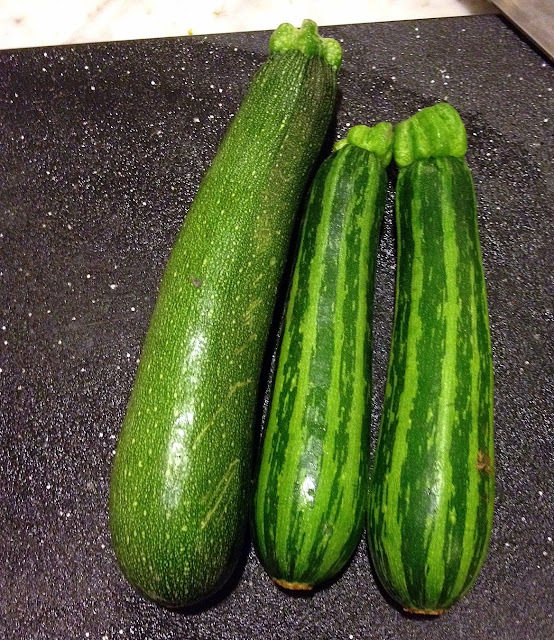 Barbara Kingsolver in Animal Vegetable Miracle wrote that large garden zucchini are so feared that at summer's end, people will not leave cars or homes unlocked for fear that neighbors -- overburdened with the bountiful crop and unable to toss the vegetable -- will leave them on the front seat or inside the front door. 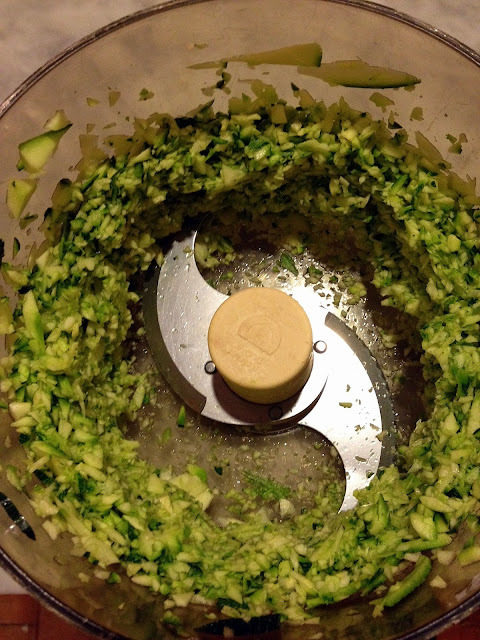 You can simply place all the dry ingredients in one large bowl, and then mix well with a fork to combine. I love the colors and variety of the "add ins" for this recipe. I brought these to work and left them with a note: Guess what kind of cookies these are. One person guessed pistachio, letting his normally excellent palate be swayed by the green flecks. Only one colleague guessed correctly. So, for you moms out there who want to get your children to eat more vegetables, this might be an easy way to go. And you don't even have to buy Deceptively Delicious or the The Sneaky Chef -- this one is on a CakeBakes gratis. Because there was no technique on the recipe card (below), I just used my common sense and invented one. 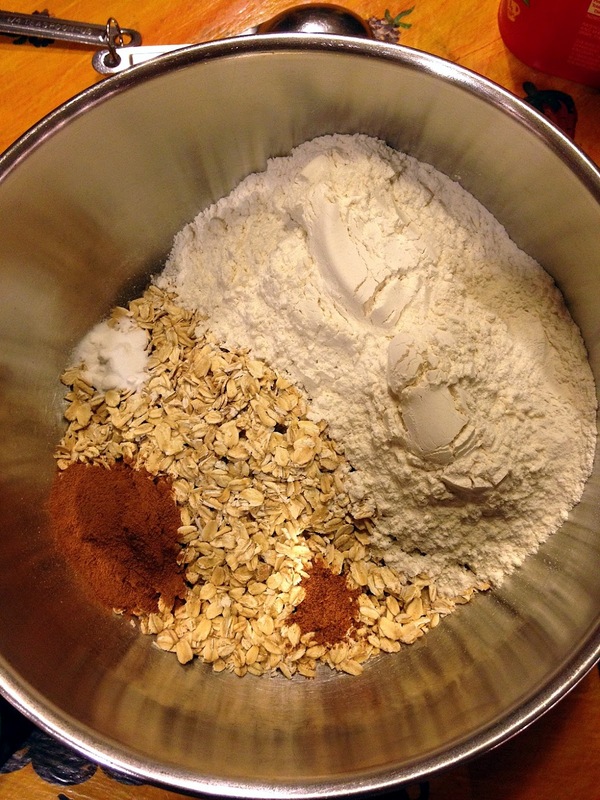 Mix flour, oats, baking soda, cinnamon and nutmeg in bowl. Set aside. Beat margarine (or butter) and sugar until light and fluffy. Add egg. 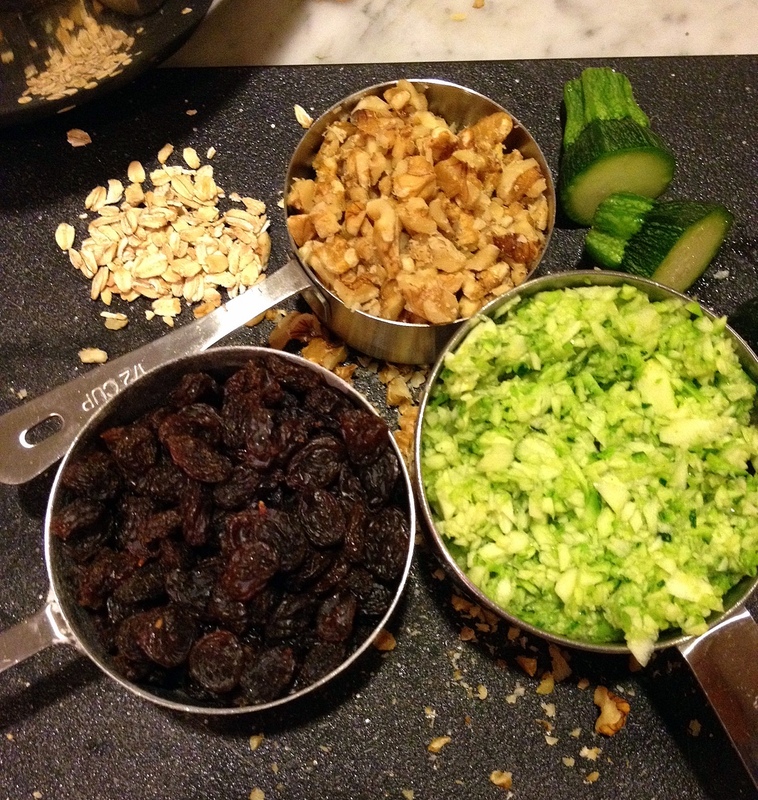 Add raisins, nuts and zucchini and combine well. Using a small ice cream scoop or a spoon, place dough in small mounds on baking sheet lined with parchment. Bake until done, about 15 minutes. How frustrating to plant vegetables and then have them attacked! Tug's Girl, if you're going to leave out the raisins, perhaps consider increasing the sugar or adding something else for sweetness as the cookies (even with the raisins) are not very sweet. Thanks for the heads up on that! Usually I substitute craisins for raisins, although chocolate chips sound pretty good, too. I may tried dried pear. I have a handful of slices left that need to be used, and they're quite sweet. Craisins would be perfect (wish I'd thought of them, not being a raisin fan either), and I think the pear would be an unusual and delicious addition. What about adding chocolate chips instead of raisins? Would that help with the sweetness? Chocolate chips would be divine. These would really taste like oatmeal chocolate chip cookies (with tiny green flecks), not that there's anything wrong with that! Yes, Paula, it's an embarrassment of "riches," I suppose, but one that I don't encounter much, living in Brooklyn. Hope you are enjoying your spring winter weather. Even though I hate the cold, I do fear for the future with all this wacky weather.